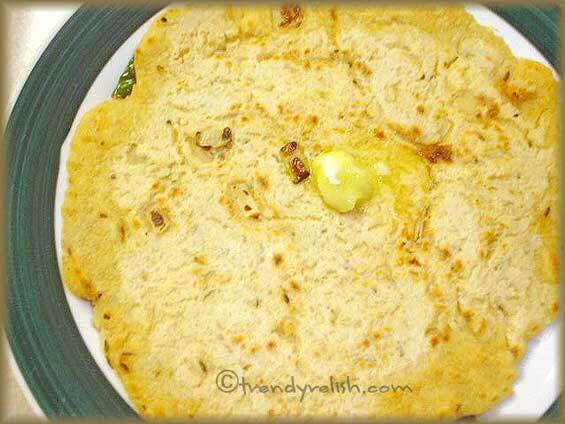 This rotti is so easy to prepare and tastes great too. 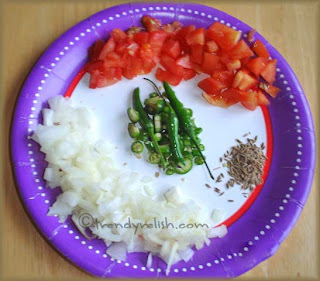 Chop the onion, green chilies and tomato into tiny pieces. Add these along with the cumin seeds, chili powder, butter and salt to the mixture of rice flour and semolina. Combine all of them to make thick dough just like chapathi dough. Let it stand for 10 minutes. Take a small ball of the dough, put it on a heated pan and spread it into a big circle with the palm. Be careful not to burn the hand. Put the flame in medium setting. Pour little oil around it. Let it cook for a while. Then flip it over with a spatula. Add little oil again and let it cook. Repeat the above process with remaining dough. Serve it with a dollop of ghee on top to enhance the taste. 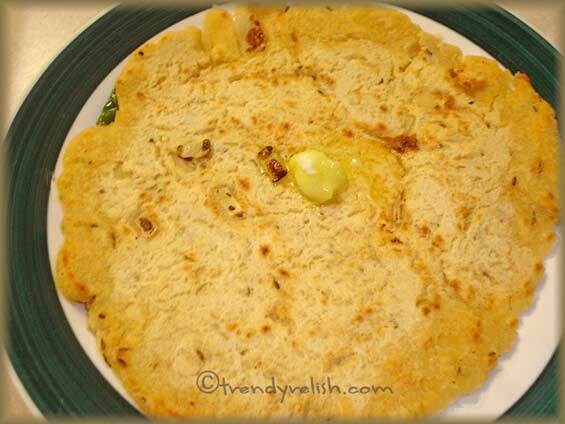 This rotti can be eaten alone without any chutney, as it is already spicy with the green chilies and the chili powder. This can be eaten as a snack or during dinnertime.Yummy!! Hi. This looks really interesting -- is it made by melting the butter first or is the butter added while still at room temperature? Good to see you again Ma Jie! Reg. your doubt: You don't have to melt the butter before adding it to the flour. Just add it to the flour while making dough and it just gets absorbed into the dough as our hands are little warm, right! I always go the easy way! Thanks for your compliments. Did you try the mango pickle? Hello again Uma. I tried the mango pickle yesterday, and wow, was it ever good! I love the combination of flavours. Will the pickle keep in the fridge for a few days? Thanks for all the terrific recipes and pictures ... and for answering all my silly questions. Glad to know that the pickle came out well. Thanks for trying. You can refrigerate the pickle for about a week. But be careful not to use any wet spoons as it makes the pickle get spoiled. I am happy to answer to your questions, so don't worry about it! I am planning to make this roti. Uma, if it is not too much of a hassle, could you please help me with the link of puffed rice (kurmura - the one that is used for bhel) upma that you had made. I am trying to find that link. I will keep looking. Sorry for the trouble.